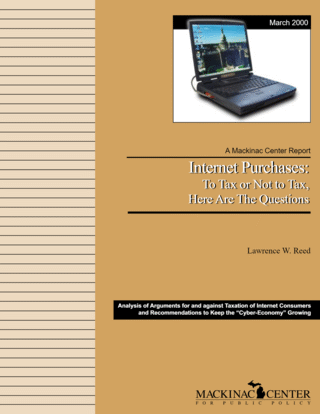 On February 2, 2000, Michigan Governor John Engler testified before the Budget Committee of the U.S. Senate on the subject of taxation of Internet commerce. His comments raised more than a few eyebrows because, as a man with a reputation for cutting taxes, he seemed to some to be calling for new taxes. It should be noted that Governor Engler carefully separated himself from the rising chorus of government officials and others who indeed support the imposition of new taxes on the Internet or Internet commerce. He opposes new taxes on access to the Internet, such as a national surtax on telephone bills. He also reportedly opposes the idea of a new national sales tax imposed by Congress on e-commerce. But he opposes a congressional ban on the states' power to collect sales and use taxes on Internet purchases, arguing that such a ban "would be an intrusion on the rights of states to set their own tax policy." To his credit, he certainly did not echo the bellicose rhetoric of South Dakota's Governor Janklow. The central issue between the states and the federal government as it relates to e-commerce is not about taxing the Internet; I am opposed to taxing the Internet. Rather, the question is how, in the future, will states collect taxes already on the books, and even more fundamentally, whether states will remain sovereign in their right to collect those taxes. In effect, the federal government will be mandating this significant price differential to those who don' t support local communities, create local jobs, pay local property taxes, and keep our cities and towns vibrant. Such a public policy is both unfair and counterproductive public policy. It is in essence, a double standard: good for clicks, bad for bricks. That "price differential" to which the governor referred would be equivalent to the amount of sales tax that a state imposes on sales within its state and the zero-percent tax on Internet purchases that the McCain-Kasich legislation would mandate. In Michigan, that differential is currently six percent. Governor Engler's position is that it is simply unfair to tax traditional "bricks and mortar" businesses six percent on their sales while exempting sales over the Internet from the same sales taxes. Essentially, this is the same sentiment the governor expressed in another context last November, when he vetoed a bill to exempt certain politically favored groups from a particular tax. He said then, "Tax policy is best which is simple and uniform, and which treats similarly situated activities in the same manner." In the strictest sense, Governor Engler does oppose new taxes and especially new federal taxes on the Internet, but he clearly favors some mechanism whereby existing sales and use taxes are collected by the states from Internet commerce. Such taxes are rarely collected now because states do not have the means to calculate them and because companies and, in most cases, consumers do not report the purchases and submit the taxes. Governor Engler supports the view of the National Governors' Association, which is proposing that states employ "trusted third parties" who will be given information about a consumer's purchase and locality, which the third party will then use to determine the amount of tax due and ensure that the revenue is routed to specific state and local government bank accounts. What Governor Engler may not realize is that basing his case for taxing Internet purchases on the "fairness" or "uniformity" argument undermines other taxation positions his administration has taken. For example, the Engler administration often has bestowed special breaks, favors, and even direct subsidies on certain businesses at the expense of fairness and uniformity, and then praised the policy as promoting Michigan's "economic development." That is what his Michigan Economic Growth Authority (MEGA) and his Michigan Economic Development Corporation (MEDC) engage in routinely. For example, last December MEGA officials authorized a $23.4-million incentive package for Webvan Group, Inc., of San Francisco, California. Webvan runs the Internet Web site webvan.com, which operates as an electronic grocery store. The e-store receives orders over the World Wide Web and fills and delivers them to its clients free of charge. The Webvan site claims that its prices, "on average, are up to 5 percent less than in local grocery stores." This clearly discriminatory policy violates Governor Engler's stated desire for fair treatment of all businesses, particularly in this case, Michigan's traditional "mom-and-pop" grocery stores. The argument for equity, fairness, and uniformity was equally absent in 1996 when the administration sought to grant Borders Books a multi-million dollar tax abatement and a huge job-training subsidy. Mom-and-pop bookstores rightly wondered why they should pay their full tax bill only to see some of their money go to train the employees of one of their giant competitors. Likewise, the governor's "Renaissance Zones" set up small geographic regions within the state where taxes are much reduced or do not apply at all. A business can literally move a mile, into a Renaissance Zone, and enjoy a much lower tax burden than its nearby competitors. One final example of administration policies that establish an uneven playing field: The MEDC offered an "incentive" package of $5.1 million in tax abatements and subsidies to New York-based Boar's Head Provisions, Inc., to establish a manufacturing presence in Holland Township last year. Meantime, a three-generation Michigan firm and a Boar's Head competitor based in Flint, Koegel Meats, pays full freight in taxes and takes no subsidies. With each new abatement or handout from MEDC, Michigan's economic playing field is further shot through with inequities and unfairness. Governor Engler's core argument for taxing Internet purchases is greatly undermined by his administration's actions in these other areas. If he were to adopt a position that the Internet should be a tax-free zone for everybody and, at the same time, restore uniformity and equity by eliminating selective abatements and subsidies in all other areas, he would at once be both consistent and in support of the most beneficial approach for the economy. The governor's position on applying sales and use taxes to Internet purchases is not an uncommon one nor is it, on its face at least, unreasonable. But, aside from the obvious inconsistency with his administration's behavior, does it really represent the best possible policy and is it based upon sound assumptions? An examination of the current state of tax law will help shed some light on these questions.